If you are wanting to get away from home for a night or two, I recommend staying here! No matter what time of year, Mt. Maunganui is a great place to retreat to and take advantage of a range of local activities and attractions to explore and experience. The fully fenced courtyard is spacious and safe. There is plenty of space for bikes, kayaks etc. in addition to the use of a lock-up space (on request) in the underground car park area. So what's so great about staying here? 1. The apartment has pretty much everything you need when going on holiday. We provide tea towels, 8 towels, bottom sheets and pillows with slips on all beds. *Bring your own blankets or request at an extra cost of $25.00. 2.The location is central and close to everything. The hot pools and cafes are right outside your door step followed with the center of town (retail shops, cafes, bars, restaurants) being only a 5 minute walk away - so close that a 2 year old could walk there on the end of your hand. 4. Ample parking. The apartment comes with 1 x secure underground car park (there is a height limit of 2m) + there is ample parking out the front of the complex. 5. There is heaps to do if you like getting out and about. Check out the folder which has recommendations and ideas of what you can do during your stay. 6. The perfect location if you are competing or supporting any triathlon, running or beach event that is based at the Mt. because the start line is literally around the corner. The unit can sleep an extra 1 person (total of 5) in the lounge on an airbed on request. We provide all bedding except your blankets. We provide towels and tea towels. We can provide blankets at an extra cost. We strictly do not have any smoking or pets inside the house. We do not permit any illegal drug use or illegal activity inside, outside or within the complex premises. PLEASE LEAVE THE PROPERTY AS YOU FOUND IT. Your stay includes a general clean - vacuum, mop, bathroom clean and laundry. Perfect location! From toothpaste to a pair of spare goggle, the property was fully stocked. Beds and sheets were super comfortable and the place was very clean. Would definately stay again. A very quick & short stay in one of our favourite places in NZ. 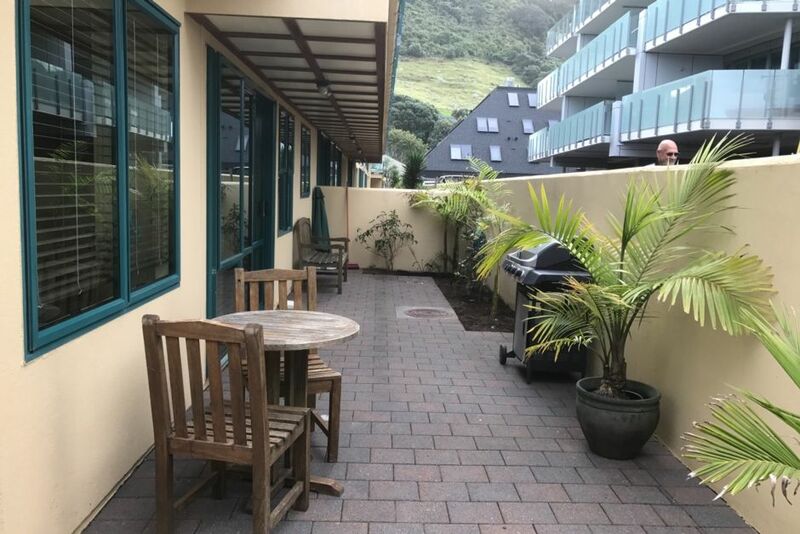 I brought my sister & brother-in-law , who are visiting from Scotland - who were absolutely delighted with the quality of the apartment and loved the Bay of Plenty area. It was very gratifying to have been able to show off this piece of New Zealand in some style! Fantastic apartment , with a perfect location, everything is in walking distance. We will definetly be back . Excellent location, clean tidy accomodation. Appreciated the little extras provided. Clean cosy accommodation, has everything you need. Location is perfect! !